One unassuming morning I was sitting at my desk when I received an email from the perfumer, Liz Zorn announcing the release of a new men’s collection, Absolute Pour Homme, which included new releases, Transcendental Musk and Rivertown Road. I didn’t even make it all the way through the email before I returned it expressing my desire to sample them. Thankfully Liz obliged and both have rocked my noggin ever since. As the name of this blog suggests, fragrance evokes moments. The good ones leave you in a trance while you recall good times. The bad ones leave you not wanting to experience that particular moment ever again. From the first time I experienced Rivertown Road I’ve been struggling with gathering my thoughts. The only appropriate adjective is extraordinary. It’s fresh and effervescent and I hear rustling leaves and have visions of a brisk fall morning when the air is just cool and dank enough so you can see your breath. The kind of morning that makes you so happy you opened your eyes that you say, thank you. Rivertown Road is earthy. It’s bright and crisp. I see brown and beautiful fall fashions. It’s the opposite of what the season usually brings, scents dominated by spice and incense. It’s a welcomed departure. According to Liz, “Rivertown Road is a complex yet modern Bay Rum Fougere with Seville Lavender Absolute, Violets, Spice Amber, Patchouli, Frankincense, Ambergris and Soft Woods.” Its inspiration is men. As she explains it, men would visit her studio in downtown Cincinnati and ask if she had anything for men. Of course she did but her genderless scents weren’t quite resonating with some of her customers. That said she set out to create a collection that continued her quest for originality, while roping in a wider audience. Until the writing of this post, I had no idea that was the case (remember, I never finished the email). 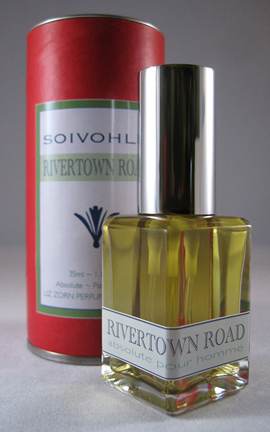 Rivertown Road is one of the most original scents I’ve ever smelled. If this is Liz’s idea of what the modern man should smell like, we are in excellent hands. It is by far one of the best fragrances I’ve smelled in 2011. Available now, 35ml will run you $135. This entry was posted in Product review and tagged best mens cologne, Liz Zorn Perfumes, men's cologne, Men's Fragrances, mens cologne review, mens top fragrances, New Fall Scents, new mens fragrances. Bookmark the permalink. Perfumepharmer, thanks for stopping by. Glad to see Rivertown Road has some fans out there. It’s a beautiful scent. Rivertown Road is fantastic, but T Musc blew my socks off. I’m addicted!